As you likely remember (especially if you attended! ), we recently celebrated our 30th Anniversary. Nearly 200 alumni (outstanding!!) plus 700 current students and faculty joined us for the event (see the photos below). The campus was buzzing all weekend with a sense of community and excitement. Everywhere one turned there was conversation punctuated by laughter – big keynote talks, lab and graduate group reunions, overflowing career panel sessions, a wonderful alumni dinner, and so many conversations over coffee, lunch, and in the hallways. The Event kicked-off with welcoming remarks from Beth Winkelstein, PhD, Vice Provost for Education and J. Larry Jameson, MD/PhD, Executive Vice President of the University of Pennsylvania for the Health System and Dean of the Perelman School of Medicine (PSOM). Scholars from across the nation gave compelling talks about their groundbreaking research. 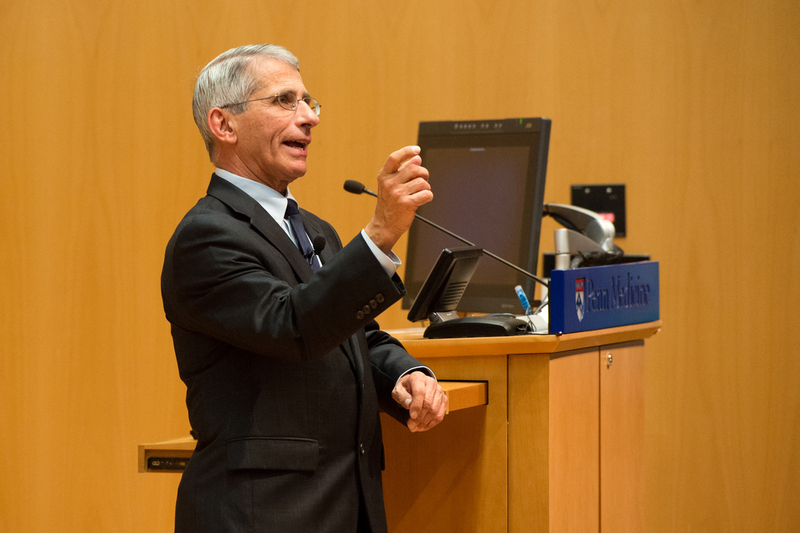 They included Anthony Fauci, MD, NIAID Director, who shared his vision for ending the HIV/AIDS pandemic, and Eve Marder, PhD, of Brandeis University, who discussed degeneracy and robustness in neurons and neuronal networks. Two distinguished Penn faculty members were also among the keynote speakers: Sarah Tishkoff, PhD, who relayed her insights from studying genomic and phenotypic variation in African populations, and Carl June, MD, who presented breakthroughs in engineering cells of the immune system to create new cancer therapies. It was a special pleasure to see alumni and their mentors reconnect over the weekend. This included the sight of another keynote speaker, and BGS alum, Aaron Gitler, PhD, of Stanford University, being introduced for his seminar by his thesis advisor, Jonathan Epstein, MD, the recently appointed PSOM Executive Vice Dean and Chief Scientific Officer. Dr. Gitler, who performed his PhD studies on cardiovascular development in Dr. Epstein’s lab, shared his latest research findings towards defining mechanisms of human neurodegenerative diseases such as ALS and Parkinson’s disease. As Dr. Epstein remarked, “It doesn’t get any better than this – watching as your former trainees explore new and unexpected directions.” And there’s more! Soon to be added to the video collection of BGS student/mentor interviews on the BGS 30th site will be a three-way discussion of research and training by Jon Epstein, Aaron Gitler and Michael Hart, PhD. Mike was a BGS student whose thesis advisor was Aaron Gitler, when Aaron was a Penn BGS faculty member. The revisiting alumni played a leading role in the Anniversary events. Several gave research seminars, while many others graciously participated in career-oriented panel discussions and a career fair, providing sought-after advice to current students considering a variety of careers, such as in the biotech, non-profit, and academic sectors, among others. Many current BGS students also gave 5-minute mini-talks or presented a poster on their research. The poster session was judged (prizes were awarded!) by the alums. It was an exceptionally gratifying 3-day event, with a lot of lasting good feeling generated. Since that weekend, I have been told on many occasions (often by Penn folks not associated with the event) how everyone at the event was extraordinarily cheerful and chatty, and that the quality of all aspects of the event was outstanding. For those of you who came to help us celebrate, I thank you! For those of you who were not able to join us, my regrets. Plan to come next time! In addition to the photos below, be sure to visit the Event website to view the student/mentor videos! Last, and as far as possible from least, my deepest thanx and appreciation to the BGS staff and all other volunteers who made it all possible. Please contact Meagan Schofer (mschofer@mail.med.upenn.edu) if you’re interested in attending or learning more.